Nuclear reactor designs closest to the Holos concept include the direct-cycle gas-cooled nuclear propulsion reactors and test reactors developed at Los Alamos National Laboratory under the Rover Program. The development of gas-cooled open-cycle nuclear reactors started in 1951 under contracts between General Electric Corporation (GE), the U.S. Air Force, and the Atomic Energy Commission (AEC ). The Rover Program started in 1955 and was dedicated to the development of “flyable” reactors for rocket propulsion with intensive efforts on determining neutronics parameters for high power density very small nuclear cores successfully operated at much higher temperatures and power ratings than those characterizing the Holos concept. 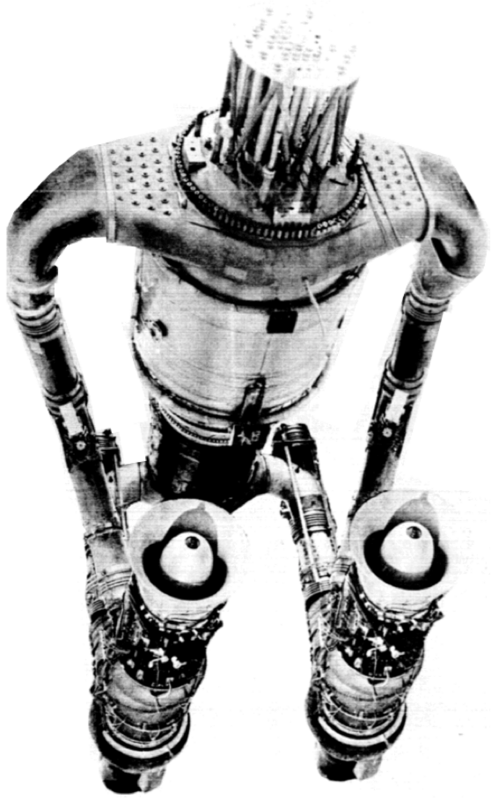 As it will be shown, reactor cores smaller than the fuel cartridge comprised in a single Holos subcritical power module, with power rating up to 28 times higher than the power rating represented by the subcritical power modules were successfully tested in the late fifties. The direct-cycle reactor development (1951-1961) was primarily performed for three propulsion systems, the nuclear turbojet, ramjet and rocket. Detailed information describing the various engineering designs, assemblies, test-rigging and performance results of open-loop direct-cycle nuclear propulsion systems are publicly accessible through declassified documents “Introduction to Nuclear Propulsion” (Flight Propulsion Laboratory Department), and the XNJ-140E Nuclear Turbojet (XNJ140E Nuclear Turbojet Unclassified Comprehensive Report, 1962), both prepared by the GE Flight Propulsion Laboratory Department in 1962 and 1963 respectively. Accordingly, the basic nuclear turbojet concept is represented, wherein the nuclear reactor is located between the compressor and power turbine. In the nuclear turbojet, air flows through various turbine compressor stages and is compressed as it inlets the reactor core where its energy content increases due to thermal energy transfer from nuclear fuel elements to the air. At the core outlet, air expands through power turbines and exhausts from the jet nozzle to provide thrust. Various nuclear turbojet designs with direct Brayton cycle were developed and tested. As shown in the schematic of a conventional turbojet with combustors, the working fluid is air & fossil fuels mixed and ignited. The first aircraft engine based on nuclear-energy operated on January 31, 1956 by means of a direct-air-cycle reactor and a modified GE J47 turbojet engine. The nuclear-powered turbojet engine resulting from this program was the XNJ-140E. This engine offered design features matching the Department of Defense requirements for a nuclear propulsion system capable of propelling military aircrafts. Overall, two different approaches to the nuclear-powered turbojet engine design were pursued in great depth, GE’s open cycle air-cooled reactor, and Pratt and Whitney’s closed-cycle, liquid metal-cooled reactor system coupled to the open-cycle turbojet engine. In the Pratt and Whitney approach, the thermal addition to the air executing the Brayton cycle occurred indirectly through a liquid metal-to-air heat exchanger positioned in place of the reactor. Tests were executed by GE at the Idaho National Reactor Test Station and involved modified J24 turbojet engines operated with nuclear power for a total of 150 hours. As part of the testing program, a small nuclear reactor was also flown aboard a modified B–36 bomber to study radiation shielding and radiation effects on aircraft materials and crews. The crew was protected by distributed shielding materials to minimize total shield weight while maintaining the radiation level at 0.02 rem-per-hour at cruise-flight condition. The resulting test results are of particular importance in the context of Holos reactor shielding as they demonstrate shielding feasibility for a “flyable” reactor with severe weight constraints. Holos can employ more effective shields with denser materials as weight is not a severe constraint for Holos stationary or mobile (non-flyable) applications. Propelling a subsonic aircraft for 1,000 hours before refueling was the main design requirement for the first set of tests, and versions of the XNJ-140 for use at supersonic speeds were at preliminary design phases when the Aircraft Nuclear Propulsion program was terminated in 1961. 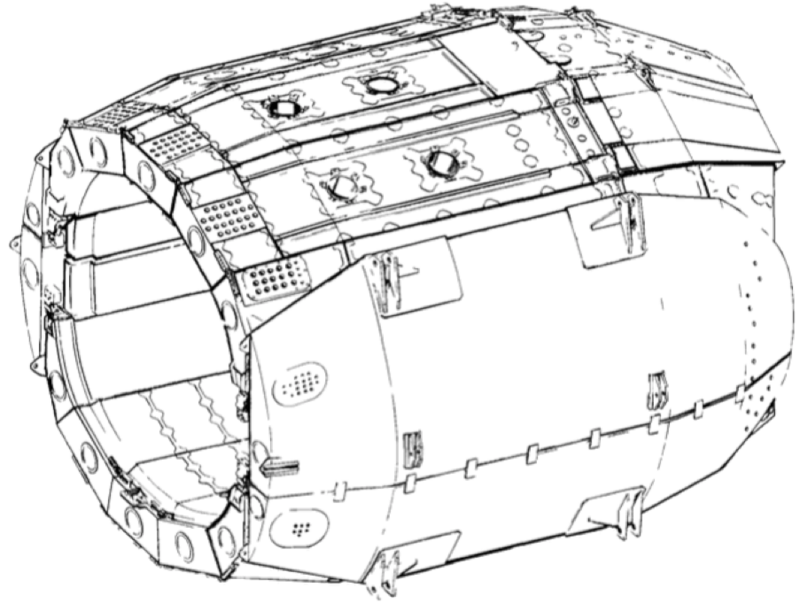 View of the side shield, with the assembly consisting of annular sectors of LiH shielding cast in 19-9DL stainless steel cans. The assembly was formed by an annular ring with flattened sides on the horizontal centerline, an outer diameter of 108.8 inches, and a major thickness of 17.0 inches. Partial sectional view of the XNJ-140E nuclear turbojet showing the compressor turbines, the central core and the power turbine-nozzle assembly. A turbojet engine exclusively operated on nuclear power was tested in January 1956 under the Heat Transfer Reactor Experiment No. 1 (HTRE-1), followed by a series of additional improved designs HTRE-2 and HTRE-3. Clad metallic fuel stock of the same type used in testing of preliminary reactor tests (P-1 reactor) was selected for HTRE-1 fuel elements. The reactor operating life of 100 hours at full power was set as design development objective, with reactor exit-air temperatures in the range of 650°C-760°C (1200°F-1400°F). This temperature range is typical of jet-fueled power turbojet systems. A total of 5 gigawatt-hours of operation was completed during the test program at power levels reaching 20MWth. During the first 6 hours of full power operation, fuel element damage occurred caused by a defect in the insulation liners. After the damaged elements were replaced, power operation was resumed and for 100 hours the reactor was tested with discharge air temperature of 693°C (1,280°F), followed by 44 hours at 749°C (1,380°F). The HTRE-3 assembly shown in Figure 3 supports the indirect cycle, wherein the reactor core heats up a heat transfer fluid (e.g. liquid metal) which then transfers its energy content to the air compressed by the turbojet compressor. 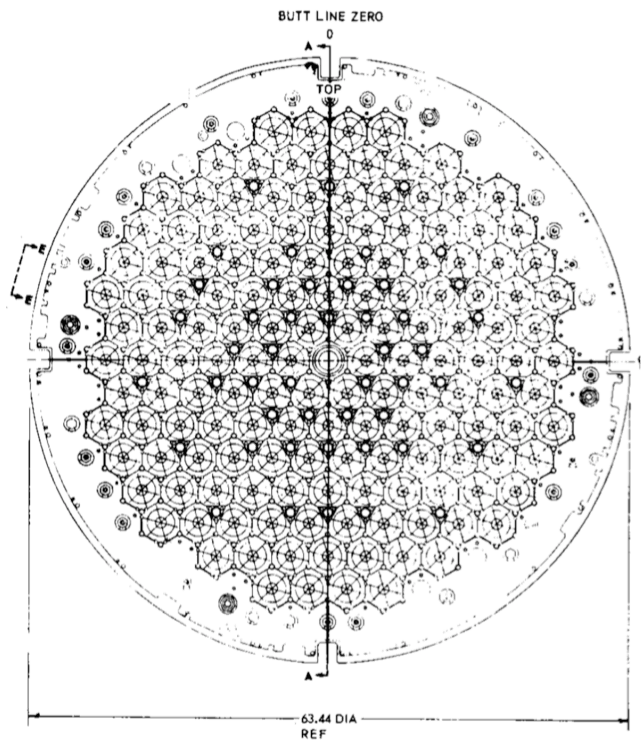 In this improved version, the active core was 30 inches long (76 cm) with a diameter of 51 inches (130 cm), and contained 150 cells inside a 3-inch-thick beryllium reflector. Each cell consisted of a fuel cartridge inside hydrided zirconium moderator elements. Reactor components were cooled by air from the turbojet compressor. In this Figure, the complete power plant and a partially assembled core along with an assembled fuel cartridge are shown. Each fuel cartridge was formed by 19 stages with U02 fuel dispersed in a matrix of 80Ni-20Cr, cladded with 80Ni-20Cr stabilized with niobium alloy. The HTRE-3 demonstrated feasibility of an air-cooled reactor using nickel-chromium fuel elements and a hydrided zirconium moderator. 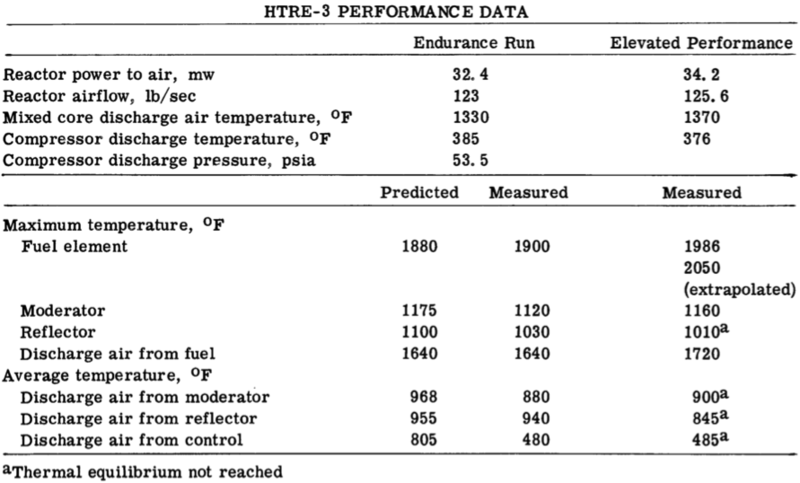 The performance of this nuclear propulsion system is summarized in Table extracted from the declassified document provided in reference (Flight Propulsion Laboratory Department). Additional reactor designs involving metallic and ceramic reactors were executed into final designs with prototype power plants built and tested. A version of the XNJ-140 turbojet was formed by two turbojet engines with a single reactor heating the air in a direct cycle configuration. Ceramic reactors were also developed to propel a supersonic ramjet missile. The TORY II-A 155MWth reactor was a ceramic reactor. While in the XNJ-140E, tests core reactivity was controlled by the insertion of control rods. 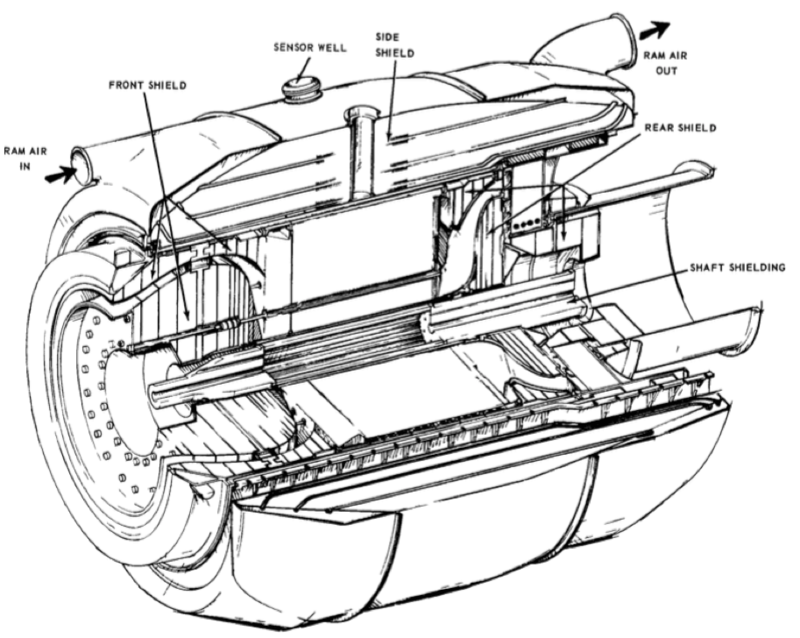 Core criticality in the TORY II-A design was regulated by “control cylinders” equipped with neutron reflectors and neutron absorbing materials so as to control chain reactions by increasing or decreasing neutron reflection or absorption. In comparison, each of the subcritical power modules for the Holos Quad configuration provides only 5.5MWth. For the scaled-up Holos Quad Titan configuration, each subcritical power module produces 34MWth. Table summarizes the main differences between the flyable reactors designed and tested with state-of-the-art technologies of the fifties and the Holos concept. In this table, key Holos design characteristics are compared with designs that manifested the highest components or design approach commonalities. In addition to substantially reduce the core power density of the Holos fuel cartridges, the fuel sealed and contained within Holos fuel cartridges is not physically in contact with the working fluid (e.g. He or CO2) and the cooling air. The Holos concept relies on neutron coupling as one of the methods adopted to execute criticality control. Accordingly, criticality tests based on coupling multiple cores and on moving reflectors, performed as part of the flyable reactor program, demonstrate feasibility of Holos reactivity control method by means of the Active Module Positioning System. Earliest critical and subcritical assemblies were developed at the Pajarito Canyon Site at the Los Alamos National Laboratory for safety tests to support the nuclear weapons program since 1947. Topsy was the first of the critical assemblies tested, followed by Lady Godiva, Jezebel, Flattop, and Big Ten. 16 Rover reactors were zero-power and proof tested at Pajarito Site. Detailed information is provided through document titled “A History of Critical Experiments at Pajarito Site” Los Alamos National Laboratory (A History of Critical Experiments at Pajarito Site, LA-9685-H, 1983). For the purposes of validating Holos coupled neutronics feasibility, the Kiwi-TNT and Parka reactor tests are of particular interest. These reactors were positioned at controlled distances from one another and operated simultaneously to determine the effects of neutron coupling occurring when clustering individual reactors to power a single rocket. Neutron coupling can also occur when clustering multiple nuclear turbojet or ramjet engines. Additional tests for flyable reactors included Phoebus-1 and Phoebus-2 with power generation rates from 1,500MW to 4,000MW attained during tests. The Kiwi-TNT and Parka reactors were closely positioned and simultaneously operated. 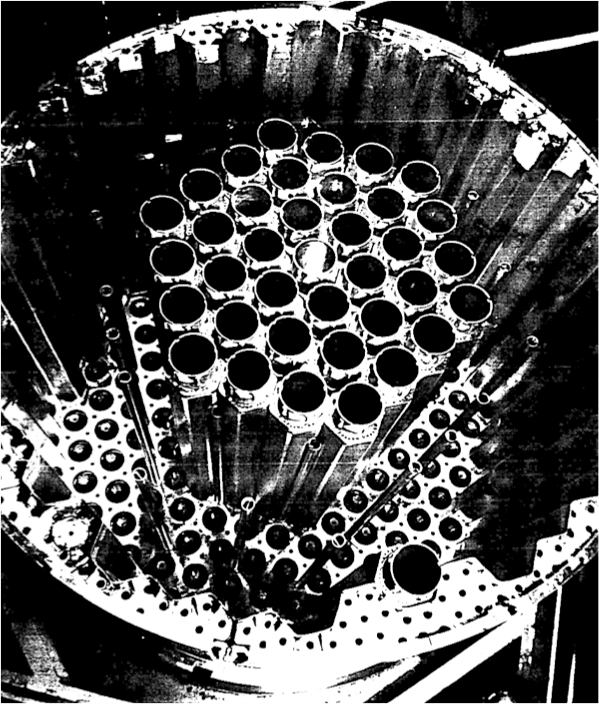 Another reactor test of particular interest to further support feasibility of Holos reactor concept is represented by the Flattop reactor, wherein multiple adjacent reflector sections were controllably moved to form a sphere surrounding the nuclear core. Holos leverages the principle that by controlling the position of multiple subcritical power modules close together, neutrons leaking at the boundary of one module become the gain of another module in close proximity, thus impacting the reactivity of each subcritical power module via controlled neutron leakages to affect the reactivity of the resulting whole core.